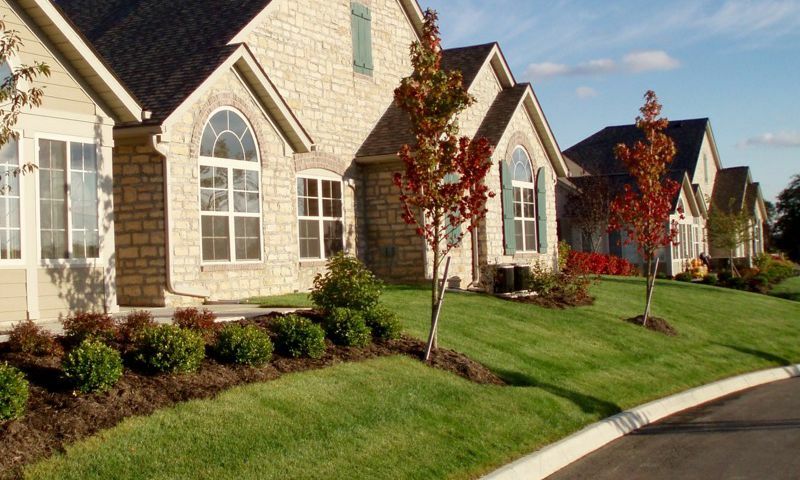 The Villas at Foor Farms is an active lifestyle community in Pataskala, Ohio. This beautiful, low-maintenance neighborhood was a former horse farm that is now being developed by Epcon Communities. The Villas at Foor Farms is spread across 24 acres of lush landscaping and will have 108 residences upon completion. Homebuyers will have charming amenities at the community's clubhouse where neighbors can gather and become fast friends. Residents living in The Villas at Foor Farms will enjoy a quiet, country setting as well as easy access to daily necessities and attractions. Residents of The Villas at Foor Farms gather at the well-equipped clubhouse. Here, they can socialize with friends in the multi-purpose room or stay healthy by using the cardiovascular and strength-training machines in the exercise room. A meeting room is the perfect place to host a community event as well as have some fun by playing at the card or billiards tables. Homeowners can prepare a quick snack in the catering kitchen as well. Just outside of the clubhouse, residents can take a dip in the swimming pool on a hot day. The patio is convenient when residents want to relax on a lounge chair and read the latest novel. A scenic pond accentuates the natural beauty in The Villas at Foor Farms that homeowners can appreciate. Epcon Communities began construction of The Villas at Foor Farms in 2005 and upon completion it will have 108 residences. These attached homes offer single-level living as well as plenty of options for personal customization. Residents will love these maintenance-free homes that offer flexible living spaces perfect for entertaining. Homebuyers can choose from two distinct floor plans in The Villas at Foor Farms. The Abbey model offers 1,750 square feet of living space with two or three bedrooms, two or three bathrooms, and an attached two-car garage. The Canterbury model offers 1,900 square feet of living space with two to four bedrooms, two or three bathrooms, and an attached two-car garage. Both attached homes feature optional second floor bonus suites, open layouts, vaulted ceilings, four season rooms, gourmet kitchens, luxurious fixtures, and plenty of storage space. Residents enjoy a low-maintenance lifestyle in The Villas at Foor Farms. An established homeowners' association (HOA) fee includes snow removal, landscaping, and exterior home maintenance. Thanks to the HOA taking care of tedious exterior chores, residents can spend their days as they wish. They can hang out with friends in the clubhouse, play cards or billiards, or relax in the pool. Located in the Columbus area, The Villas at Foor Farms provides homeowners with all of the conveniences they would want or need. Just a few minutes down Broad Street residents will find retail shops, fast food chains, and restaurants. A Kroger is close by for groceries and Licking Memorial Urgent Care is available for medical needs. Golf lovers are a few minutes away from Broadview Golf Course to practice their game. Residents can take long walks or go jogging at the Thomas J. Evans Foundation Park. For big-city entertainment, Columbus can be reached in less than an hour. Port Columbus International Airport is also available for long-distance travel. The Villas at Foor Farms is a quaint active lifestyle community within a convenient location in Licking County, Ohio. There are plenty of activities available in The Villas at Foor Farms. Here is a sample of some of the clubs, activities and classes offered here. 55places.com is not affiliated with the developer(s) or homeowners association of The Villas at Foor Farms. The information you submit is distributed to a 55places.com Partner Agent, who is a licensed real estate agent. The information regarding The Villas at Foor Farms has not been verified or approved by the developer or homeowners association. Please verify all information prior to purchasing. 55places.com is not responsible for any errors regarding the information displayed on this website.